Castleton View Road in Castleton, Virginia. Photo by Sherry Davis. The news of Maestro Lorin Maazel's passing in July brought forth a colossal wave of accolades and tributes from the world of classical music as well as mainstream media, with the majority reiterating his legendary status. I decided to wait until the storm subsided to take up my pen and write about the man who's art and generosity I came to experience one beautiful spring in rural Virginia. It's my hope that providing a personal account of his beloved Castleton will bring awareness and patronage to this special place and to the man beyond the podium, who was just as passionate about the cultivation of young artists and the human spirit as he was about being a conductor and musician. Although Castleton was the Maestro's private home and family retreat away from the world stage, he opened its doors in dedication to art and benevolence. How fortunate to have had the opportunity to take up residence there and inhabit his world if only for a short while! An excerpt from my diary entry of February 19th : I was just notified last week of my acceptance as an apprentice for the Chateauville Foundation and their Castleton Residency production of The Beggar's Opera. How exciting it was to receive the news! It's going to be an incredible journey living and working with so many brilliant directors, artists and singers. The Beggar's Opera (1728) and other ballad operas fathered the German Singspiel, a genre that Mozart would master, so I'm looking forward to studying this connection in greater detail. According to The Complete Book of Light Opera, ballad opera was considered to be an eighteenth-century protest against the Italian conquest of the London operatic scene. In drawing a parallel, it can be argued that the Singspiel was Mozart’s protest against the Italian presence in Vienna. I'll be departing for Castleton this weekend and will be there until the end of March. I'll write as time permits! Fair Haven House was my home away from home in Castleton. Photo by Sherry Davis. One of my friends had purchased tickets for us to see Alfred Brendel with the Cleveland Orchestra on his farewell tour on March 2nd, a concert I had to forgo due to the apprenticeship, but I could hardly call it a sacrifice! The adventure I was about to undertake would be unprecedented. The Castleton experience hearkened to centuries past, representing a return to simplicity, to nature, where art can thrive and incubate outside of the highly complex environments in which we typically live and work today. "It really is the way it used to be. We went to live with the teacher," an artist explains in this inspiring video. In functioning like the theater family of yesteryear, it is indeed a rarity, a gem, in our industry. There were several houses on the property (Castleton Meadows) where artists lived happily alongside the workings of a Virginia farm, a world-class theater and the Maestro's Civil War-era manor house. I resided in Fair Haven with other female participants who included singers, stage directors and costume designers. There was no television (purposely, I'm sure! ), but alas, there was a keyboard! Some nights were spent singing together and gathering around the piano. As in Mozart's 18th Century, the keyboard was at the center of social conversation. On any given day, I would often hear singing throughout Fair Haven House. English soprano Sarah Gabriel enjoyed warming up with Mozart's Solfeggi from K. 393, vocal exercises most likely written for his wife Constanze to help prepare her to perform the Mass in C Minor (K. 427) in Salzburg. My roommate, Sarah, allowed me to borrow her score of Mozart's Solfeggi, K. 393. Photo by Sherry Davis. When I saw Maestro Maazel for the first time, he was walking into the theater house to join everyone for breakfast. His manner was welcoming, unassuming and casual. He wore jeans from time to time which lent to the rustic charm. He treated us all like a family, with warmth and sincerity. I recall him coming into breakfast one morning and saying, quite comically, "Yes, those eggs are ours. We have 14 hens and they lay 14 eggs a day." His sense of humor was always at the ready and he often had everyone around him in stitches with laughter! Although the Maestro was in Castleton for a good part of the residency, he also had obligations to fulfill as Music Director of the New York Philharmonic. On February 26th, he took the orchestra to perform in an historic concert in Pyongyang, North Korea, which was broadcast on Korean state television and also aired internationally. In the Maestro's words: "I have always believed that the arts, per se, and their exponents, artists, have a broader role to play in the public arena. But it must be totally apolitical, nonpartisan, and free of issue-specific agendas. It is a role of the highest possible order; bringing peoples and their cultures together on common ground, where the roots of peaceful interchange can imperceptibly but irrevocably take hold." His philosophy permeated throughout the residency. Castleton was abuzz with news of the successful campaign. And there was much excitement surrounding the Maestro's appearance on The Colbert Report! Like Maestro Maazel, I have always believed that a life in service to music is a life in service to others. And I hope that I'll always have opportunities throughout my career to act as a catalyst for cultural exchange and collaboration through my work. Again, Maestro Maazel's words inspire me: "In these confused times, the role of classical music is at the very core of the struggle to reassert cultural and ethical values that have always characterized our country and for which we have traditionally been honored and respected outside our shores." On opening night, the theater house was especially adorned with natural elegance. Photo by Sherry Davis. As Production Management Apprentice on the farm, I worked with Executive Director Douglas Beck and Project Coordinator Ronit Schlam who were normally based in the Maestro's New York City office. One minute I was sitting on stage as a model for lighting designer Rie Ono and the next minute I was running into the neighboring town of Culpeper for prop materials. I wore many hats and I loved every minute of it. The comprehensive yet intimate scale of the experience gave me an understanding of performance chronology and operations that I could not have gained anywhere else. My responsibilities included assisting with the set, arranging travel and housing, creating the opera program and managing payment schedules for personnel. And in between, there were visits with farm animals (Omar the camel was a favorite! ), walks, trampoline sessions, trips to the bowling alley in the theater house, a golf cart ride, a ping-pong match and a bit of tennis here and there. I was even witness to the birth of baby piglets! After weeks of rehearsals and preparations, opening night was upon us. I took on box office duties, distributed programs and ushered guests. When everything was in place, I took my seat in the front row. In the orchestra pit in front of me, Maestro Maazel was conducting the Keio University Orchestra of Japan. The intimate theater space gave way to many memorable moments in the performance in which the singers and the Maestro flirted playfully with the audience in both dialogue and action with cast members venturing beyond the stage to carry the story forward. This would not have been possible in a larger venue (again, very 18th Century!). For example, when Macheath said "I must have women," the Maestro replied from the pit, "I know the feeling!" My diary recollects the scene: It was a riot, especially as this dialogue followed Macheath's aria Lilies and Roses in which the Maestro gave such a dreamy look and the crowd roared with laughter. 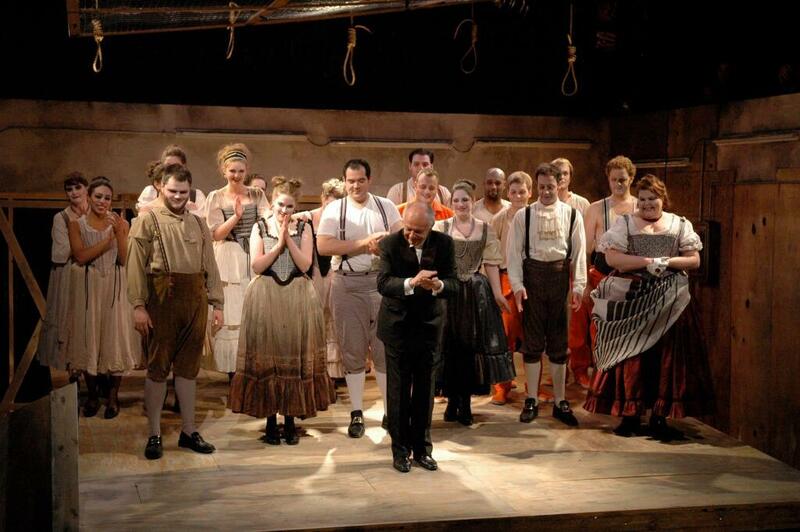 Maestro Maazel takes a bow with our cast of The Beggar's Opera. Photo by Castleton Festival. When I heard the news of the Maestro's passing, I reached out to my Castleton friends and sent condolences to the Maazel family through their son Orson. He will be greatly missed by the countless lives he touched, including mine, through his kindness, wisdom, generosity and masterful musicianship. The Maestro so lovingly dedicated himself to his Eden, Castleton Meadows, to enrich lives through art, nature and community. There is no worthier or nobler pursuit and I know that his work will only strengthen through the continued efforts of his family. I'd like to close with a 2013 quote from Maestro Maazel accompanied by his 1966 performance of Mozart's violin concerto K. 216 with the Vienna Philharmonic: "Every performing musician has a very personal view of Mozart, who is a universal voice. And each one of us, whether you're a spectator or a musician, finds a truth within himself or herself revealed by the extraordinary clarity of his music." Thank you for this most beautiful account. Castleton is a place of dreams - the junction of pastoral elegance, simplicity and the familial and benevolent ties of the arts. Beyond any award or post, the maestro's Eden best represents his noble pursuit here on earth as an artist and human being. It is a living legacy that I hope will endure for many more generations to experience. Beautifully stated, Sheryl! I hope that my account touches many more lives in the way that it has touched yours. Thank you!